Oh, oh, noooooo! Surely someone has a better answer for you. Can loan you something for your hike. I hope it pans out for you on this new tool. Just makes me sad that we can't hear from you more often. There are generic chargers for cell phones that run on 2 AA batteries maybe one of those would work for your new toy. At least it would solve the charging issue. I've heard of solar chargers, but know nothing about them..... anyone else out there familiar with them? They might be cost prohibitive. 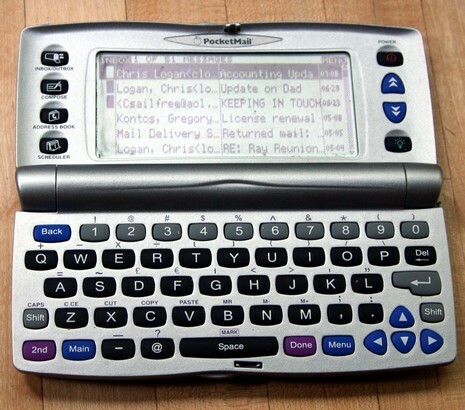 I remember there was something a few years ago, maybe it was that pocketmail device you had or maybe it was something else. They marketed it towards grandparents ("Now I can email with my grandchildren!") Cannot recall the name if it, but I remember seeing it as little as three years ago. I was going to mention a solar charger too. Seems perfect for long hikes, no need to buy lots of AAs. this solar charger has 11 different adapter tips, and is advertised as working with *any* hand held device, although I don't know how true that is. The problem with the battery operated chargers or solar chargers is their weight and bulkiness. Folks have used the Devotec charger with the Peek with good success apparantly. Looks to be smaller than a cell phone, and can charge the peek in 3 hours. You would be surprised how your mind knows QWERTY even when you only type with your thumbs. I think you will do better than you think you will. Also, there's also the possibility of hitting the local library while you are in town. Nearly every library these days has public computers with Internet service. Even some Internet cafes do. Don't they make keyboards that fold up into something the size of this device? My cousin had one years ago he used with his Palm Pilot and it was great. Full size QWERTY, takes up very little space when folded.